1956 | Remains of L.A.
Tonight Ari and I went and got pizza at Mazzarino’s. It was actually a lot more complicated than that; we did not plan ahead and drove around for quite a while trying to look up places on the list while my phone kept dying, and at one point a man almost walked his dog directly into Ari’s car, but the important part is that no dogs died and we ended up at Mazzarino’s. -High ceiling room with massive black chandeliers, terra-cotta tiles on the floor and halfway up the wall, large paintings showing scenes of Italy. The room was a little oddly shaped, sort of long and narrow, but I still liked it. 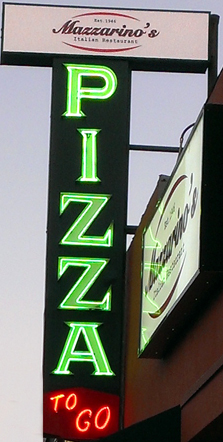 Categories: Restaurants | Tags: 1956, pizza, Restaurants, Sherman Oaks | Permalink. My friends Corey and Suze had both expressed an interest in going to Beeps, so David (my husband) and I arranged to meet them there for dinner. Then we were really late because we hadn’t counted on traffic being as rough as it was. There are few things I hate more than being late. Beeps had been described to me as a diner, but it’s really more of a sandwich/burger stand with a tiny indoor eating area and a slightly less tiny patio. The counter has an order window both on the inside and the outside, and if you’re eating there they’ll bring you your food. Categories: Restaurants | Tags: 1956, Diners, Los Angeles, nostalgia, onion rings, patty melt, Restaurants, retro, van nuys | Permalink. It was incredibly hard to get a picture of this sign to show up on my camera as anything other than a block of light. But I stuck with it. 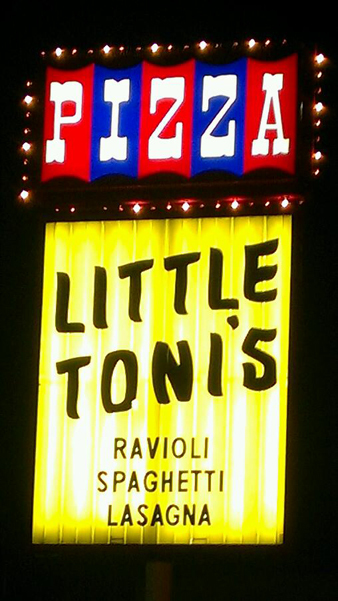 Wasn’t planning on going to another place Friday night, but we went to a party at a bar and when we got there the kitchen was closed and I was hungry and Little Toni’s was just down the street, so David (my husband) and our friend Corey and I walked over. I had always assumed, for some reason, that it was a pizza-by-the-slice type place, with a counter and rickety tables. Turned out to be a sit-down restaurant, much nicer than you usually see open till 2 a.m.
-Getting there was confusingly difficult; it sits on a wedge-shaped corner where three streets cross at odd angles and none of the crosswalks seemed to lead there. We were finally forced to nervously jaywalk. 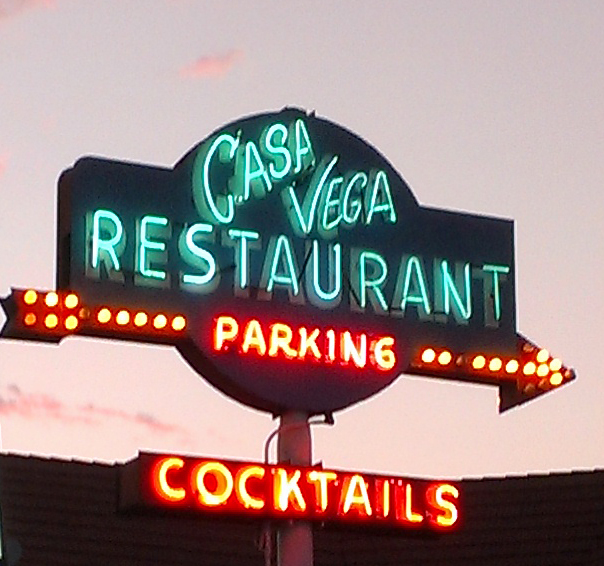 Categories: Restaurants | Tags: 1956, north hollywood, pizza, Restaurants, retro, vintage | Permalink.